Bo Bartlett is an American realist with a modernist vision. His paintings are well within the tradition of American realism as defined by artists such as Thomas Eakins and Andrew Wyeth. Like these artists, Bartlett looks at America’s heart’its land and its people’and describes the beauty he finds in everyday life. His paintings celebrate the underlying epic nature of the commonplace and the personal significance of the extraordinary. Bartlett was educated at the Pennsylvania Academy of the Fine Arts, where realist principles must be grasped before modernist ventures are encouraged. He pushes the boundaries of the realist tradition with his multilayered imagery. Life, death, passage, memory, and confrontation coexist easily in his world. Family and friends are the cast of characters that appear in his dreamlike narrative works. Although the scenes are set around his childhood home in Georgia, his island summer home in Maine, his home in Pennsylvania or the surroundings of his studio and residence in Washington state, they represent a deeper, mythical concept of the archetypal, universal home. 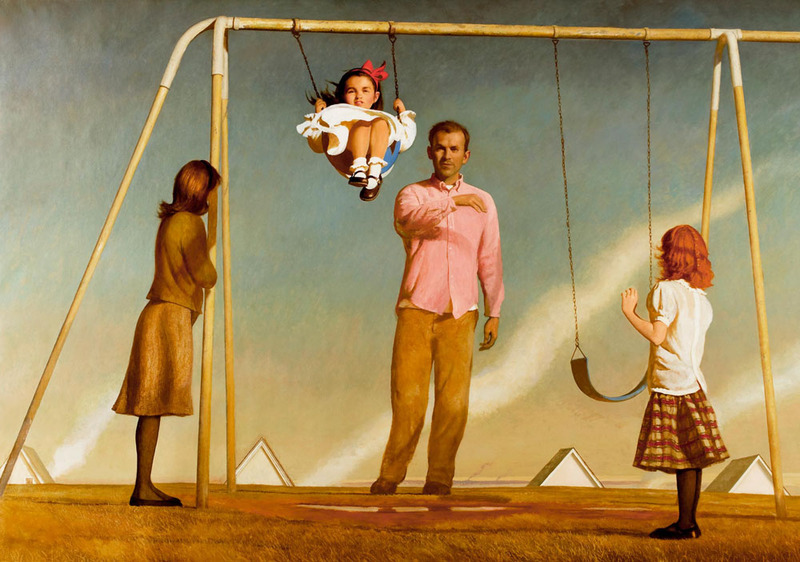 "Spoiler alert, if you ask ten artists who inspires them, half will answer Bo Bartlett. As a gallery owner you can divide artists into two categories: what and how. Often it is about “how" an artist actually applies the paint that makes them special or it’s “what" they choose as their subject. Bo Bartlett has both, this is a rare thing. The way he paints is completely unique as well as what he chooses to paint. In his work he’s chronicling our American story and our shared history. 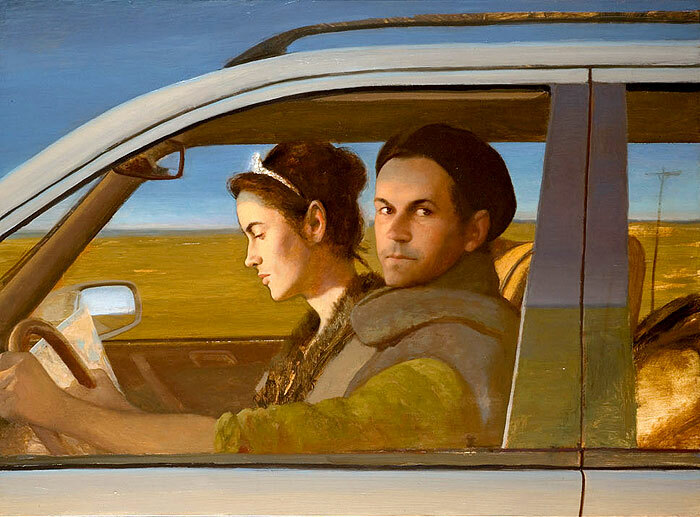 Being from Maine and growing up in the land of Wyeth, I feel like it’s safe to say that Bo Bartlett picked up the story where Andrew left off." It's so... human... Very refreshing and heart warming! 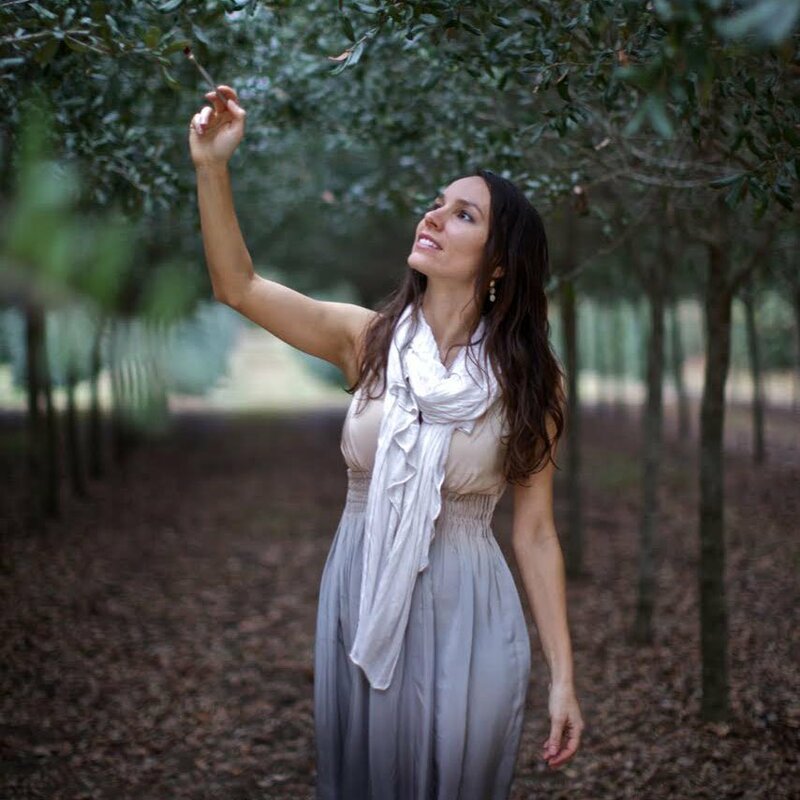 Beautiful images, beautiful idea! We need more beauty and warmth in our lives! k , you can tell dad is looking at his family's doom on the horizon. A nuclear bomb my guess. I love both of these works. wow, that first painting kinda creepy,the guy looks like ted bundy on a roud trip.the car shoulda been a light blue vw bug. remember? The guy in the First painting has this look on his face like, he hates his marriage and regrets taking such a long trip with his cheating wife. A pictyre truly worth a thousand words. This feels so familiar, on the web site- those REAL people.This painter portrays life, not dreams or nightmares or other worlds of creatures & cartoons, but life as we know it and feel it. congratulations sir, you ARE an ARTIST.